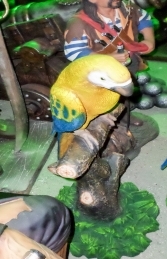 This is a highly detailed Macaw model, shows this bird perching on a authentic tree branch. 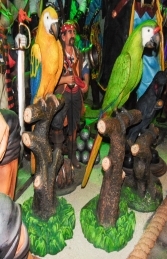 This fantastic Macaw model has a quizzical look on his face and comes complete with their perch and is ideal for adding detail to any pirate, caribbean or jungle themed areas, advertising or drawing attention to your business. It can be used in any themed area or in shops, businesses, pubs, restaurants, coffee shops, adventure golf courses, zoos, theme-parks.. or even in your own home.